During the summertime, there is always the thrill of playing in your local summer league. You have the MC, who keeps the crowd entertained, the crowds are always raucous, and the DJ, who plays the hottest current songs. At the Dyckman Basketball Tournament in the Washington Heights section of Manhattan, there is always bound yo be plenty of greatness. The tournament, which is celebrating its 25th anniversary, is sponsored by Nike and is one of the top summer leagues in New York. It has also been billed the “Red Carpet of Streetball” by many. This past Friday night, there was plenty of excitement in the air as Dyckman put together the best young talent mixed with high schoolers and collegiate stars up against the SEED Project, a program based out of Senegal. The SEED Project is a program which specializes in providing academic, athletic opportunities for many youth in Senegal, as well as career and leadership preparation. As of today, close to 100 student-athletes that are former SEED alums are playing in different countries all around the world including the United States. Morocco, Spain, Germany, Rwanada, Lithuania and countless other places. About eight of the players from Team Senegal/SEED ranged from 6-7 to 7-0. Five of them are currently or have played Division I basketball. A lot of their players were battle tested and were able to keep up with their counterparts throughout the game. The home team, Dyckman All-Stars, was a crew assembled of some of the finest players that have graced the famed Dyckman court. The team, which was coached by Mike Jones, founder and head coach of the famed Dominican Power streetball team that was stacked with Division I talents such as Shavar Newkirk (St. Joseph’s), Mustafa Jones (Central Connecticut State) and Eric Paschall (Villanova University). There were other hidden gems on that roster such as Elijah Davis (Odessa College), Vincent Franklin (Casper College) and Adonis De La Rosa, formerly of St. John’s University, who is now at Williston Junior College in North Dakota. The lone high schooler on the Dyckman team was Jahlil Tripp, a rising senior out of Brooklyn’s Lincoln High School. Another player on the roster that needed no introduction was Luis Montero of South Plains College in Texas, who was a recent entry into the 2015 NBA Draft. In the first half, the game brought out about a competitive battle. Sidy Sall and Cheikh Sane were both efficient in scoring from the inside and outside for Team Senegal/SEED. However, Team Dyckman countered behind Vincent Franklin and his outstanding play. Throughout the game, both teams went back and forth scoring baskets. There was plenty of toughness from the guards and bigs from both sides. In the end, there could only be one winner. 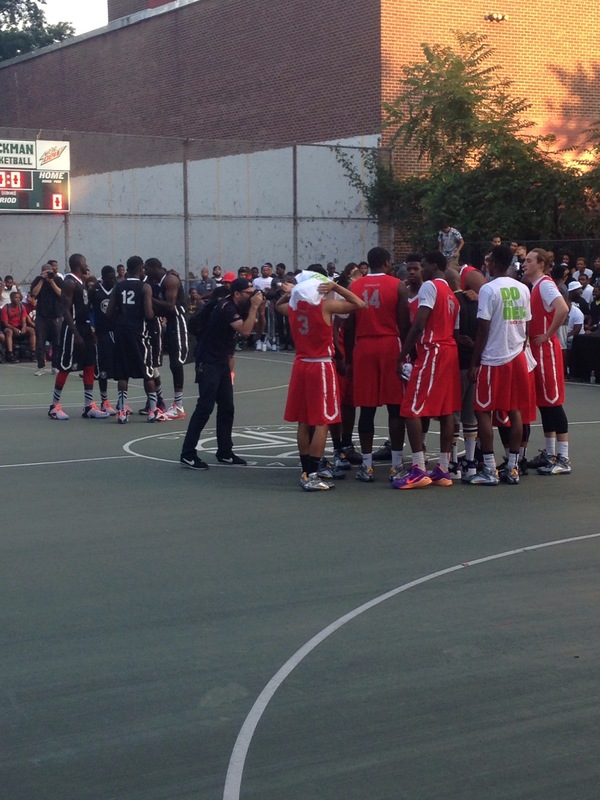 Dyckman All-Stars emerged victorious, 51-45. Vincent Franklin won the MVP Award with 10 points. Sidy Sall led for Team Senegal/SEED with 13 points. It was a good day for basketball in New York City. The opportunity of playing against international competition is something that should be treasured. Your pride, the honor of your neighborhood and your reputation is on the pride. The memory of this game is something that the players on both sides will cherish for a lifetime. Elijah Davis, Odessa College, Class of 2016 – Davis is an efficient shooter. He has good dribble moves and is able to get to the basket at will. Adonis De La Rosa, Williston Junior College, Class of 2017 – De La Rosa is a big man with a good shooting touch. He is able to bang around the basket and is able to grab rebounds with precision. Eric Paschall, Villanova University, Class of 2019 – Paschall is a very domant forward that can bully his way around the paint is very aggressive. He can also score baskets with little problem. Cheik Sane, Marshall University, Class of 2015 – Sane is a mobile forward that can step out of the paint and shoot jumpers from long range. He can also get to the rim with efficiency. Cheik Bamba Diallo, Kilgore College, Class of 2017 – Diallo is a true point guard. He can shoot and score from multiple places on the floor, but he mainly knows how to run a team. Shavar Newkirk, St. Joseph University, Class of 2018 – Newkirk is a guard that can slash to the basket as well as set up teammates for baskets. He also has tremendous ballhandling skills. Vincent Franklin, Casper College, Class of 2016 – Franklin is a forward that plays above the rim and can do damage on the defensive end. He also has a knack of shooting jumpers. Luis Montero, South Plains College, Class of 2015 – Montero is a good ballhandler and is aggressive when going to the basket. Sidy Sall, Christian Brothers University, Class of 2015 – Sall is a versatile swingman that can dominate and do plenty of damage from plenty of places on the court. Jahlil Tripp, Abraham Lincoln High School, Class of 2016 – Tripp is very aggressive when going to the rim. He knows how to attack the basket when having the ball.